Nepalese cuisine comprises a variety of cuisines based upon ethnicity, soil and climate relating to Nepal's cultural diversity and geography. Dal-bhat-tarkari (Nepali: दाल भात तरकारी) is eaten throughout Nepal. Dal is a soup made of lentils and spices, served over boiled grain, bhat—usually rice but sometimes another and vegetable curry, tarkari. Condiments are usually small amounts of spicy pickle (achaar, अचार) which can be fresh or fermented, and of which there are a considerable number of varieties. Other accompaniments may be sliced lemon (nibuwa) or lime (kagati) with fresh green chilli (hariyo khursani). Dhindo (ढिंडो) is a traditional food of Nepal. Much of the cuisine is variation on Asian themes. Other foods have hybrid Tibetan, Indian and Thai origins. 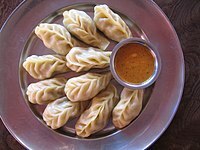 Momo—Tibetan style dumplings with Nepalese spices—are one of the most popular foods in Nepal. They were originally filled with buffalo meat but now also with goat or chicken, as well as vegetarian preparations. Special foods such as sel roti, finni roti and patre are eaten during festivals such as Tihar. Chow mein is a Nepali favorite in modern times based on Chinese-style stir fried noodles. It is one of the most beloved everyday staple lunch in Nepalese household today. Dal-bhat-tarkari is the standard meal eaten twice daily traditionally by the Khas people. However, with land suitable for irrigated rice paddies in short supply, other grains supplement or even dominate. Wheat becomes unleavened flat bread (roti or chapati). Maize (makai), buckwheat (fapar), barley (jau), or millet (kodo) become porridge-like (dhido or ato). Tarkari can be spinach and fresh greens (sag), fermented and dried greens (gundruk or sinki), white radish (mula), potatoes (alu), green beans (simi), tomatoes (golbeda), cauliflower (kauli), cabbage (bandakopi), pumpkin (farsi), etc. The climate of Hilly region remains moderate throughout the year. These kind of climate is perfect for Horticulture. Fruit traditionally grown in the hills include mandarin orange (suntala), kaffir lime (kagati), lemon (nibuwa), Asian pear (nashpati), and bayberry (kaphal). Mangoes (aanp), Apples (syauu), Peach(Aaru), Plum (Aalcha or Aarubakhara), Appricot ("Kurpani".. In some seasons there is excess amount of these fruit produced. These excesses fruits are changed into some cuisines. Alcohol, Pickles, Dried fruits and Fruit juice are made from those excess fruits. Dahi (yogurt) and curried meat (masu) or fish (machha) are served as side dishes when available. Chicken (kukhura) and fish are usually acceptable to all including the Khas Brahmin (Bahun) caste. Observant Hindus never eat beef (gaiko masu). They also eschew buffalo and yak meat as being too cow-like. Domestic pork (sungurko masu) was traditionally only eaten by aadibasi, however wild boar (bangur ko masu) was traditionally hunted and eaten by magars. A strain derived from wild boar is now raised in captivity and used for meat that is increasingly popular with Pahari ethnicities and castes that did not traditionally eat pork. Himalayan cuisine is influenced culturally by Tibetan and closely related ethnic groups in the Himalaya and Trans-Himalaya. The Himalayan region is not fertile as compared to other regions. Moreover, the climate is cold throughout the year with heavy snowfalls. The food crops grown in this region are buckwheat, millet, naked barley, common beans, and high-altitude rice. Potatoes are another important staple crop and food. Substantial amounts of rice are imported from the lowlands. Because of the cold temperature, people often prefer hot and warm foods like soup, thukkpa (ramen), strong tea and strong alcohols. Grain is made into alcoholic beverages (see below). Butter tea is made by mixing butter or ghee and salt into strong tea. This tea preparation is commonly mixed with tsampa flour to make a kind of fast food especially eaten while traveling. The cattle raised in this region are yak, chauries (yak and cow crossed), Himalayan goats, and sheep. People raise these animals for meat, milk, cheese , and dahi (yogurt). Most of the Himalayan regions are hard to reach. There is no proper means of transportation because of higher altitudes and it is a considerable challenge to build good road transportation. Hence only rice and some spices like salt are imported from other regions by air transport or by using animals as their means of transportation. People in this region eat dhido (millet or barley cooked dough), potato curry, momo (dumplings), yak or goat or sheep meat, milk, thukppa, or strong alcohol like tongba (millet juice) for their regular diet. This region also imports rice from other regions and consumes daal-bhat-tarkari from time to time. Thakali cuisine—transitional between Himalayan and lowland cuisines—is eaten by Thakali people living in Thak-Khola Valley, an ancient and relatively easy trade route through the high Himalaya. This cuisine is also served in inns (bhattis) run by Thakalis alongside other trade routes and in Pokhara and other towns in the hills of central Nepal, that were said to offer the best food and accommodations before the great proliferation of facilities catering to foreign trekkers. Thakali cuisine is less vegetarian than Pahari cuisine. Yak and yak-cow hybrids locally known as Jhopa were consumed by the lower castes. All castes eat the meat of local sheep called Bheda and Chyangra or Chiru imported from Tibet. Meat is sliced into thin slices and dried on thin poles near the cooking fire. Blood sausage is also prepared and dried. Dried meat is added to vegetable curries or sauteed in ghee and dipped into timur-ko-choup which is a mixture of red chili powder, Sichuan pepper, salt and local herbs. This spice mixture also seasons new potatoes, or eggs which may be boiled, fried or made into omelets. Thakali cuisine uses locally grown buckwheat, barley, millet and dal, as well as rice, maize and dal imported from lower regions to the south. Grain may be ground and boiled into a thick porridge that is eaten in place of rice with dal. A kind of dal is even made from dried, ground buckwheat leaves. Grain can be roasted or popped in hot sand (which is then sieved off) as a snack food. Thakalis also follow the Tibetan customs of preparing tsampa and tea with butter and salt. Ghee is used in this tea preparation and as a cooking oil otherwise. Since most Thakali people were engaged in trade, they could import vegetables, fruits and eggs from lower regions. A large variety of vegetables were consumed daily, some—especially daikon radish and beetroot—dried and often prepared with mutton. Soup prepared from spinach known as gyang-to was served with a pinch of timur-ko-choup. Apples were introduced following the arrival of foreign horticulturists and are now widely enjoyed. Image of a Newa cuisine "Samaybaji"
Newars are an urbanized ethnic group originally living in the Kathmandu Valley, but now also in bazaar towns elsewhere in the world and Middle Hills. In the fertile Kathmandu and Pokhara valleys, local market farmers find growing produce more profitable than grain, especially now that cheap rice and other staples can be trucked in. Furthermore, Newar households have relatively high incomes and their culture emphasizes food and feasting. Although daily Newar food practices consist mostly of components from the generic hill cuisine, during ritual, ceremonial and festive eating, Newar dishes can be much more varied than the generic Pahari ones. Newari cuisine makes wide use of buffalo meat. For vegetarians, meat and dried fish can be replaced by fried tofu or cottage cheese. The cuisine has a wide range of fermented preparations, whereas Pahari cuisine has beyond a few aachar condiments. Kwāti (क्वाति soup of different beans), kachilā (कचिला spiced minced meat), chhoylā (छोयला water buffalo meat marinated in spices and grilled over the flames of dried wheat stalks), pukālā (पुकाला fried meat), wo (व: lentil cake), paun kwā (पाउँक्वा sour soup), swan pukā (स्वँपुका stuffed lungs), syen (स्येँ fried liver), mye (म्ये boiled and fried tongue), sapu mhichā (सःपू म्हिचा leaf tripe stuffed with bone marrow) and sanyā khunā (सन्या खुना jellied fish soup) are some of the popular festival foods. Dessert consists of dhau (धौ yogurt), sisābusā (सिसाबुसा fruits) and mari (मरि sweets). There are achaars made with aamli fruit. Thwon (थ्वँ rice beer) and aylā (अयला local alcohol) are the common alcoholic liquors that Newars make at home. There is great importance of food in Newari culture. Newari cuisine is one of the most delicious food with intense flavorings. There are dishes for every edible part of buffalo meat (cooked and uncooked) that includes intestine, stomach and brain. That's another reason why they are famous. Buffalo meat and pork are eaten by many janajati (indigenous nationalities with customs departing from Hindu norms). More traditionally, Magars ate pork but not water buffalo while the superficially similar Gurung did the opposite. Further east, Tamang, Rai and Limbu have unique ethnic foods including kinema (fermented soybeans), yangben (Reindeer Moss), preparations of bamboo shoots, bread made from millet or buckwheat, and traditional Limbu drink tongba (millet beer). Food in the Terai south of Sivalik Hills refers to mirror cuisines such as Maithili cuisine in the east, Tharu cuisine in the west, and Bhojpuri cuisine in the center and near west of Madhesh region of Nepal. Further west, there is Mughlai-influenced Awadhi cuisine—particularly eaten by the substantial Muslim population around Nepalganj. Terai diets can be more varied than in the Middle Hills because of greater variety of crops grown locally plus cash crops imported from cooler microclimates in nearby hill regions, as well as from other parts of Greater Nepal. Fruit commonly grown in the Terai include mango (aap), litchi, papaya (armewa/mewa), banana (kera/kela) and jackfruit (katahar/katahal). A typical terai set includes basmati rice with ghee, pigeon pea daal, tarkari (cooked variety of vegetable), taruwa (battered raw vegetables such as potato, brinjal/aubergine, chili, cauliflower etc. deep fried in the oil), papadum, mango/lemon pickles and yogurt. For non-vegetable items, they consume mostly fish or goat curry. Traditionally there never used to be poultry items but nowadays, due to urbanization, poultry items are common, too. Nepal has seven low elevation Inner Terai valleys enclosed by the Sivalik and Mahabharat ranges. Historically these valleys were extremely malarial and populated mainly by the Tharu and Maithil peoples who had genetic resistance. Since the valleys were isolated from one another, Tharu enclaves spoke different dialects and had different customs. They may have had different cuisines, although this has not been very well studied. Nevertheless, most Tharu historically obtained a varied diet through hunting and gathering as well as shifting agriculture and animal husbandry. This contrasted with diets of Pahari Hindus that were predominantly agricultural and used only a few sources of animal protein because of religious or caste prohibitions. In the 1950s, when Nepal opened its borders to foreigners and foreign aid missions, malaria suppression programs in the Inner Madhesh made it possible for people without genetic resistance to survive there. The Tharu and Maithil faced an influx of people fleeing land and food deficits in the hills. Conversion of forest and grassland to cropland and prohibitions on hunting shifted the Tharu and Maithil in the east and west away from land-based hunting and gathering, toward greater use of fish, freshwater crab, prawns and snails from rivers and ponds. Tharu raise chickens and are reported to employ dogs to hunt rats in rice paddies and then roast them whole on sticks. Mutton may be obtained from nomadic hill people such as Kham Magar who take herds of sheep and goats up to sub-alpine pastures bordering the high Himalaya in summer, and down to Inner Madhesh valleys in winter. Increasing competition for land forces the Tharu and Maithil people away from shifting cultivation toward sedentary agriculture, so the national custom of eating rice with lentils gains headway. The Tharu or Maithil have unique ways of preparing these staples, such as rice and lentil dumplings called bagiya or dhikriand immature rice is used to make a kind of gruel, maar. Taro root is an important crop in the region. The leaves and roots are eaten. Sidhara is a mixture of taro root, dried fish and turmeric that is formed into cakes and dried for preservation. The cakes are broken up and cooked with radish, chili, garlic and other spices to accompany boiled rice. Snails are cleansed, boiled and spiced to make ghonghi. Another short compendium of Tharu and Maithil recipes includes roasted crab, wheat flatbread fried in mustard oil, and fried taro leaf cakes. Lohorung are indigenous to eastern Nepal. They have a variety of food in their cuisine made from local ingredients. Some of them are Tongba, Wachipa, Wamik, Masikdaam, Kinima, Sibring, Sel roti, Bawari, Dhule Achar, Saruwa, Chamre, Yangpen, Dibu, and so on. Snacks include maize popped or parched called khaja (literally, "Eat and run. "); beaten rice (baji or chiura), dry-roasted soybeans (bhatmas, Nepali: भटमास), dried fruit candy (lapsi), and South Asian foods like the samosa and South Asian sweets. International snacks like biscuits (packaged cookies), potato chips and wai wai (Nepali: वाइ वाइ, instant noodles) are all coming into widespread use. Whereas, some youths in Nepal prefer western snacks as they are easy to get and less time consuming. Tea (chiya) usually taken with milk and sugar, juice of sugarcane (sarbat), and buttermilk (mahi) are common non-alcoholic beverages. Alcoholic beverages include raksi, spirits made in rustic distilleries, and jard, homemade beer made from rice. At higher elevations there is millet beer Tongba and chhaang. Western culture has influence in Nepalese cuisine. Western food like bread, cereals, bagels, pizzas, sandwiches, burgers, and pastas, and drinks like Coke, Fanta, and Sprite are common in cities and places where there are a reasonable number of tourists. Middle-class families residing in cities consume these foods on a daily basis. One can find them in almost all the restaurants around cities. Meals are traditionally eaten seated or squatting on the floor although urban restaurants have tables and chairs. A large mound of bhat (boiled rice or other grains such as cornmeal or barley) or a pile of roti (rounds of thin unleavened bread) is served on a Jharke thal—a rimmed brass or stainless steel plate about 12"/30 cm. diameter. The rice is surrounded by smaller mounds of prepared vegetables, fresh chutney or preserved pickles, and sometimes curd/yogurt, fish or meat. Soup-like dal and vegetables cooked in sauce may be served in separate small bowls, to be poured over the rice. Food is brought to the mouth with the fingers of the right hand. The left hand—traditionally used for certain toilet purposes—should never touch food but may hold cups and glasses. The right hand should be rinsed before and after eating. The majority of the Nepalese population follows Hinduism. The caste system separates people into high and low castes. There are certain rules and regulations that so-called high caste and low caste need to follow, which influence their cuisine and the container they cook in. In such contexts water itself is highly subject to pollution, affecting containers as well. Clay or wooden containers must then be discarded while metal containers require ritual scouring. You will often find people drinking water by pouring it into their mouths rather than touching their lips to the container, to avoid polluting the container and contents. Hinduism forbids high caste people from eating meat from cow, yak, and pig, whereas low caste people can consume these meats without any restriction. But the supreme court of Nepal has abolished the caste system. Dry-cooked grains—including beaten rice and roasted soybeans or corn—and rice pudding cooked in milk rather than water (khir), as well as raw fruit, are less subject to ritual pollution. These foods can be accepted from any clean caste but not from the Dalit. However water and foods cooked with water can be problematic. Traditionally they are not to be cooked or touched by a person of lower caste than the recipient. For this reason even in a polygamous household the first wife should not be of lower caste than her husband. Foreigners and members of many partially Hinduized janajati ethnic groups may occupy an ambiguous space, neither fully untouchable nor fully "clean". They may not be welcome inside upper-caste homes and should not presume to enter without being invited (and not just invited to sit outside on the porch). Upper-caste Hindus may decline to eat with them at all, or may avoid eating foods that are most subject to ritual pollution. Breaches of dietary etiquette were made criminal offences in Muluki Ain—the main corpus of civil law—in 1854 and not decriminalized until 1962. Since 1962 discriminatory customs have been falling into disuse among educated and urban Nepalese, yet they often prevail in the countryside. Guests and visitors should try to conform to tradition until clearly instructed otherwise by their hosts. ^ "Pickle - Achar - Chutney". Food-nepal.com. Retrieved 12 September 2010. ^ Lok Nath Devkota. "Deciduous Fruit in Nepal". FAO. Retrieved 14 October 2013. ^ "?About Historical and Contemporary Limbu Women of Nepal?". Forum.welovenepal.com. 24 June 2008. Archived from the original on 15 November 2016. Retrieved 12 September 2010. ^ "The Sikkim cuisines". Indiatraveltimes.com. Retrieved 12 September 2010. 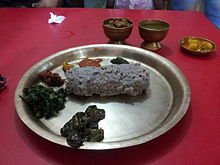 ^ "Nepali Mithila Cuisine". Mithilacuisine.blogspot.com. Retrieved 12 September 2010. ^ "Tharu Cuisines and Delicacies (in Pictures) - The Nepali Food Blog | theGundruk.com". The Nepali Food Blog | theGundruk.com. 2016-01-16. Retrieved 2018-09-15. ^ VOICE OF THARUS: Excuse me, it’s escargot! Saidi, Nicole. "In search of Nepal's culinary identity." CNN. 14 October 2011. This page was last edited on 13 April 2019, at 15:08 (UTC).